Your first stop for fun and ski expertise on your Red River adventure is Wild Bill’s Ski Shop located at the corner of Main Street and Pioneer (a block and a half from the ski area, and a half block walk to the new Platinum chair) in beautiful downtown Red River New Mexico. Let us be your one stop shop for a fun and hassle-free vacation! Wild Bill’s has ski and snowboard rental packages to fit every level of experience and every budget! Wild Bills retail area offers gloves, goggles, beanies, caps, gloves, sleds…whatever you may need to enjoy your Red River Winter vacation. Wild Bill’s customer service is tops! 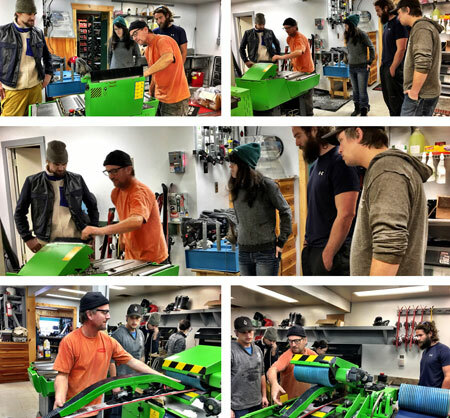 Our tech room is equipped with Wintersteiger machines to tune our equipment and keep it in top shape; Wild Bill’s certified technicians can also service your personal pair of skis or snowboard, whether you need a wax job or complete tune to get the most out of your equipment. To help make your vacation complete, Wild Bill’s also offers three wonderful units available for nightly rental. Wild Bill’s offers ala carte rentals of equipment for those that own their own boots, boards or skis. Reserve ski, snowboard and snowblade equipment for your Red River ski adventure. Receive 10%! The Koffee House, is Red River’s newest little coffee spot! Click to learn more! The Summer Shop has it all from unique Red River. Beautifully hand-crafted jewelry, gizmos and gadgets for the wee little adventurer, and so much more. Wild Bill’s Ski Shop located at the corner of Main Street and Pioneer in beautiful downtown Red River New Mexico. Click here for our location. Each ski rental package includes skis, boots and poles. Wild Bill’s has three ski packages to choose from: Basic, Performance and High Performance. We also offer a Demo Package for the skier that is looking for the highest performing equipment. We have two packages for our snowboarders: a Basic Snowboard package and for the discriminating snowboarder a Performance package with high end retail snowboards that will please the most experienced snowboarder. For those new to skiing or snowboarding, the Wild Bill’s technicians can walk you thru every step of the process to make your ski rental/snowboard rental easy! We are committed to great fit and comfort. Skiing and snowboarding should be fun, not confusing! Wild Bill’s staff are friendly, knowledgeable and dedicated to customer service! We want your skiing experience in Red River to be the best it can be!